The heart of our activity is the restoration of vintage cars for collectors and amateurs. We repair and rebuild bodywork parts, recover spare parts and restore the original appearance of the car. The vintage cars, Jeris Ferrari told us, is an extremely delicate type of car that has survive to the present day defying rain, snow and hail, but also hot and windy blows that have inevitably left their mark on the bodywork. A life full of satisfactions and goals, the result of a rigorous commitment, a deep respect for our customers, ALL customers, a strong, unshakable, unmistakable seriousness, humility and fairness combined with a strong determination. Our specialty? All sports cars, racing, and vintage cars in general. From the burning love for the Ferrari cars... to the pleasure of restoration, a process that is actually a true "reanimation", starting from the choice of which parts to recover, to their cleaning and painting to the replacement of the parts and so on up until the final stage of the restoration. Car restoration definitely requires a very peculiar, hard-to-come by wealth of experience: in a vintage car every detail is something new, different from what we may have seen previously and therefore requires the touch of a true expert. Making a mistake, even a very small one could jeopardise the final result (the whole car). Jeris Ferrari has a very unique built-in talent: the ability to highlight the shape, charm and style of vintage cars that today's cars has not matched yet. Because of this our customers can be sure that his work is always highly qualified and careful even when dealing with notoriously "tough" vintage cars like the Ferraris of yesterday and today. This is both thanks to his experience and skill but also to the availability of new or vintage spare parts as well as the availability of cutting-edge equipment. In this way it is possible to find any mechanical part and regenerate it to perfection. Collectors all over the world entrust their vintage cars to us knowing they can count on Jeris' outstanding experience spanning over 50 years. 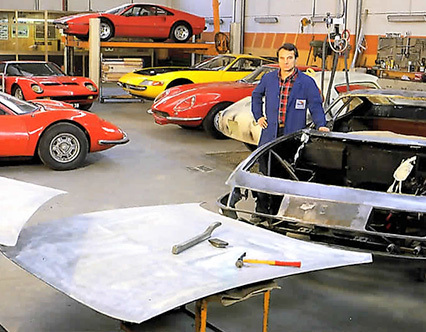 For over 25 years, Enrico Ferrari, Jeris' son, has supported his father in the management of this renowned body shop, thus continuing the family tradition.